The annual Riviera Run sees Mini fans driving down to Cornwall for a mini festival, a show and shine and, of course, the chance to cruise the streets of Newquay and elsewhere in a display of automotive passion. It’s a friendly occasion; there’s rarely any trouble and all the owners help and appreciate each other. In short, this is what driving for pleasure should be about. Americans have known this almost from the inception of the automobile. Cruising the streets in Daddy’s car has always been part of the rites of growing up and, despite or indeed because of all the pressures on modern youth, it still is. What a shame then that in the UK the practice is frowned upon by the dark denizens of bureaucracy. Needless to say, British youth don’t really help themselves. They’ve never really got to grips with the concept of cruising. For a minority, the idea of fun is to tear up and terrorise the neighbourhood or supermarket car parks inciting the inevitable challenges to The Bill. If they are not doing that they are tear-arsing about the place in a manner likely to kill themselves or at the very least encourage the insurance companies to grossly inflate their premiums. Meanwhile, across the pond from Kissimmee to Surf City, Americans of all ages need no encouragement to head off in their prized wheels to events both organised and disorganised all over the USA or for just a night out on the town. Some sounds on the stereo, a nonchalant elbow on the doorsill and their best girl/boy by their side, they will slowly cruise the strips buying burgers and beer and being seen. With a V8 under the hood, they have no need to show off. Perhaps this isn’t really being fair to British car fans. It’s probably hard to look really cool in a knackered Citroen Saxo but as our overseas cousins have shown it isn’t so much the motor as the manner in which it is done. Around the UK in the Spring and Summer there are plenty of car shows of one description or another. The Goodwood Festival of Speed is perhaps the best example but the attendees are by and large spectators and not participants. 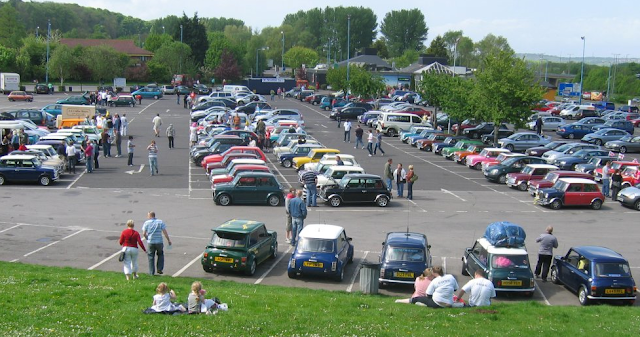 It is one thing to descend on a field in some bosky glade to see and be seen but it isn’t the same as a gathering of likeminded motor nuts on public streets getting together for the sheer joy of driving. The Riviera Run is a fairly rare event. It could be argued that, unlike the USA, our climate isn’t conducive to fun outdoors but they seem to manage at Glastonbury. It’s a well known fact that fun is generally discouraged in this country. The authorities would much prefer us to sit indoors and watch brain-numbing television but it is worth a shot. Turn up and support your local car events; Classic, Show and Shine, whatever. It doesn’t matter what you drive as long as you drive. ‘Cruising For Burgers’ is a melodic interlude by Frank Zappa & The Mothers of Invention.